Hundreds of parents across the borough are understood to have taken their children out of school on Tuesday (May 3) as a protest over the ‘stress’ of new SATs exams. The strike was in support of the national Let Our Kids Be Kids campaign, which is hitting out at the introduction of written tests for Year 2 pupils. More than 40,000 people have signed the petition lobbying the Department of Education to scrap the new style of testing, which will kick off in schools next week. Until this year, children in Key Stage 1 were assessed by teachers in lessons but now pupils are facing a week’s worth of written papers under exam conditions. Melissa Watson, 23, is supporting the campaign but decided not to take son Jay, six, out of school so as to preserve his 100 per cent attendance. The mother-of-one, who lives in the Old Town, said: “I am really scared for Jay, because I think it’s too much too young. He is in Year 1 at the moment but is due to take the SATs next year. 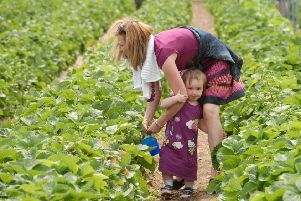 Sophie Squire, from Tring, took sons Sam, seven, and three-year-old Harry to the Green Dragon Eco Farm near Aylesbury for the day instead of taking them to school. Mrs Squire said: “My three-year-old came home from nursery and told me about alliteration. But I don’t think he needs to know about that yet. He should be learning about sheep and other farm animals. “My oldest is an August baby and has been struggling with the work. There’s too much expectation. “Since starting the new curriculum in Year 3, he can be exhausted and angry when I go and collect him, and says school is boring. Teacher Jane Couzens also joined the campaign and visited the British Museum in London for the day at the request of her two children Alice, seven, and Tom, five. Mrs Couzens, also from Tring, said: “It’s heartbreaking. I feel totally powerless. Herts politicians from both the Lib Dem and Conservative parties backed the tests in conversation with the Gazette. Mark Watkin, of the Lib Dem opposition, said he ‘sympathised’ with parents but believes they shouldn’t protest ‘at the expense of their children’s education’.